I’ve reviewed a number of art-related books on this blog, and for good reason … I began my education as an art student and haven’t fully abandoned it, so I have a keen interest in the fine arts. This book, Paint It, by Mari Bolte, has been in my to-read queue for over a year and I think that the main reason I didn’t get to it sooner was that I was thinking that this was intended for elementary school children, and I didn’t think I was ready to review such a book (I like to practice what the book teaches in a case like this). What I discovered is that this is for the advanced student or the beginner adult. There are terms and practices here that I highly suspect would go over most students’ heads. The opening paragraphs, describing pigments and binders alone might be more than most would want from an art book. Children want to dig in. As an adult, I really appreciated the refreshers on some of the information, as well as learning some new things about some of the mediums that I haven’t worked in. The photos here, and the paintings themselves, are colorful and extremely attractive. I greatly appreciated Bolte’s playfulness. For instance, she writes: “There are many ways to paint the same object. Pick one object and challenge yourself to paint it in three styles—realistic, stylized, and abstract. Can you do it?” And then she proceeds to paint a simple fox in realistic, stylized, and abstract form. This is such an important lesson and shows the budding artist that there is no one, right way to create art. As someone who has often painted pictures from photos I’ve taken, I really appreciated her comments: “It’s easy to paint your favorite photo with watercolors. But why make an exact copy? Instead, focus on the space’s lights and darks (values), shades (tones), and basic shapes.” And again, she provides examples from her own work, and she explains the process of how to create something similar (in this case through an eight-step process). While this book is possibly geared toward a younger readership, I found this to be such a valuable resource that I’ve ordered a physical copy to be used as a resource for my own purposes. It is packed full of useful information, tips, and techniques. This is highly recommended. Looking for a good book? 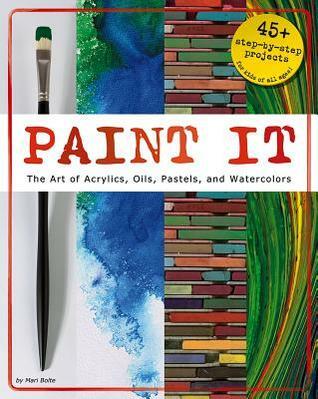 If you, or someone you know is at all interested in painting, this book, Paint It, by Mari Bolte, is an extremely valuable resource and should be within arms reach for every artist.